Mainly clear. Low 43F. 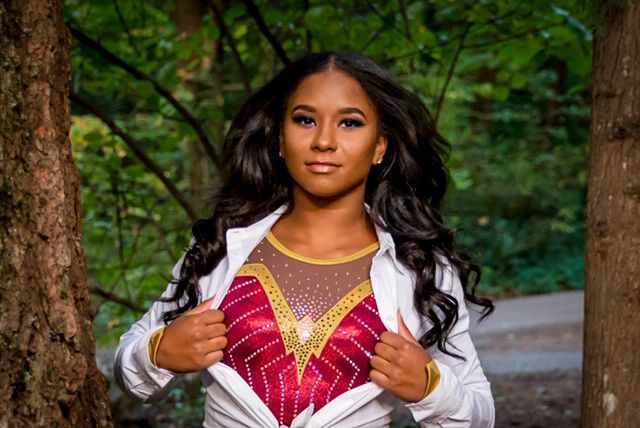 Winds WNW at 5 to 10 mph..
Jordan Chiles balances life as a teenager at Prairie High School with her love for gymnastics and competing all over the world for the Senior US National Team. The 17-year-old trains every day at Naydenov Gymnastics Center in Vancouver. She hopes to make it to the 2020 Olympics. Jordan Chiles shows off the Wonder Woman leotard designed by her mother Gina. Jordan Chiles performs on the balance beam at the 2018 US Championships in Boston. She finished in second place on the vault. Her floor routine to the Wonder Woman theme went viral, even lassoing the attention of actress Gal Gadot. Much like Michael Jordan, who she is named after, it often seems like Jordan Chiles is defying gravity. The 17-year-old from Brush Prairie is a member of the Senior US National Team, trains 32 hours a week at Naydenov Gymnastics Center and dreams of competing in the 2020 Olympics. She is also a senior at Prairie High School and recently signed a college letter of intent to join the UCLA gymnastics program. Whenever Jordan Chiles sees that giant American flag hanging on the wall at a meet, there’s something about those stars and stripes that bring out the best in her. Gina Chiles named her daughter after Michael Jordan for a reason. Jordan Chiles has embraced that message by staying in public school. Teenage prodigies usually homeschool, allowing them to travel freely. Chiles makes the sacrifice because of her friends and support system at Prairie High School. Even though she doesn’t compete for the Falcons, the school keeps a space in the trophy case for her latest piece of hardware. She gets up at 5:45 a.m., goes to school for half the day, arrives at Naydenov in the afternoon and trains until about 7 p.m. Then, she has dinner and completes her homework before going to bed. She said she tries to get seven or eight hours of sleep. Gina Chiles said the teachers at Pleasant Valley and Prairie High School have been supportive of her daughter’s dream. Chiles had an unbelievable 2018 on the competition circuit. In March, she earned a bronze medal in the all-around at the DTB World Cup in Stuttgart, Germany; in April, she helped her team win the Pacific Rim Championships in Medellin, Colombia, by placing first on the vault and the floor exercise; in August, she claimed second place on the vault at the US Championships in Boston. Boston also marked the first time she got to compete alongside Olympic champion Simone Biles. Jordan Chiles also turned heads by wearing a Wonder Woman leotard, designed by her mother Gina. Jordan Chiles didn’t expect the leo to catch much attention, but it quickly went viral. It even lassoed the attention of Wonder Woman actress Gal Gadot. She added that there was a hidden number 23 on the leotard in honor of Michael Jordan. Which leads to the question: who Jordan Chiles would like to meet more? As her calendar flips to 2019, Jordan Chiles vows to give everything in her mind, body and spirit to earn the opportunity to compete for Team USA at the 2020 Olympics in Tokyo. Whatever happens in the next two years, Jordan Chiles hopes her journey is an inspiration to others. She enjoys every minute of it. Every tumble and every triumph.